TII's Lightning Surge Protector greatly increases subscriber premise reliability and reduces consumer electronic equipment failures. These failures are caused by induced HIGH VOLTAGE surges that appear on the center conductor of coaxial drop cables within the home. 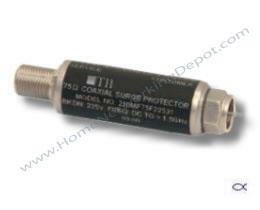 The protector's unique IN-LINE design and 75 ohm impedence matching is virtually transparent to all analog or digital bi-directional signals utilized in the bandpass of DC to 1.002Ghz. TII's patented proprietary coaxial gas tube surge protector is equipped with an intergral failshort mechanism for a power-cross condition. The DC breakdown voltage of the protector is low enough to protect against even the smallest transient surges, yet causes no conflicts with VoIP network powered applications. The metallic housing of the TII IN-LINE Coaxial Lightning Surge Protector provides adequate EMI shielding. It also is environmentally sealed to prevent ingress of moisture and humidity that has been shown to introduce CPD to a subscriber's premise drop. Ideally suited to shield costly HDTV receiver, CATV settop converters, stereos systems, plasma television screens, cable modems, and DVRs from potentially damaging surges. UL 497 & CSA Listed Certified assures excellent fire protection and user protection. Fillfills National Electric Code mandate for surge protection of network powered IP telephone NID requriements. Unique IN-LINE design is impedance matching to 75 ohms and is virtually transparent to all . Protector are enviromentally sealed to prevent ingress of moisture and humidity. All ports are have be tested to withstand 30 psi of internal pressure. All ports comply to all existing SCTE standards. All components are temperature hardened. Devices designed to remain stable in enviroments of -40 to +65o C and maintain all technical specifications. Metallic housing of the protector provides excellent EMI shield, effective beyond 130dB. NESC Compliant 4.55mm ground clamp, with stainless hardware wood mounting screws and UV protected labels.